What kinds of housing options are available on a college campus? There's more to living on campus than eating Ramen noodles! Depending on your perspective, living on campus can be either one of the most exciting or scary times in your college career. Campus living is a chance for many college students to live away from home for the first time, and that can be a huge step. Like many students, you may have many questions about housing on campus. What will your new dorm will be like? Will you get along with your roommate? 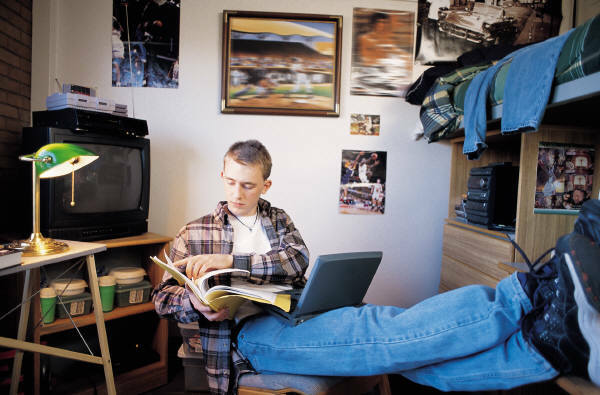 As a student with a disability, you may have some additional questions about dorm life. Some colleges have older dorms that were not originally built to be accessible for people with disabilities, while others have newer buildings that follow modern accessibility standards. Residence Life staff at some colleges may be well-versed on working with disabled students, while others still have a long way to go. Regardless of where you go to college, you can work with your Residence Life and disability services office to make campus living an accessible experience. This module will discuss housing accommodations for students with various disabilities, and how to request them.